Sights of crews in hazardous waste protection suits and a local creek full of oil weren't a case of deja vu. It's happened again, and Greka is busy cleaning up the mess. ANOTHER MAJOR SPILL : A second major oil spill in as many months at the Northern Santa Barbara County Greka Energy Corp. facility spread to Firestone Vineyard property. 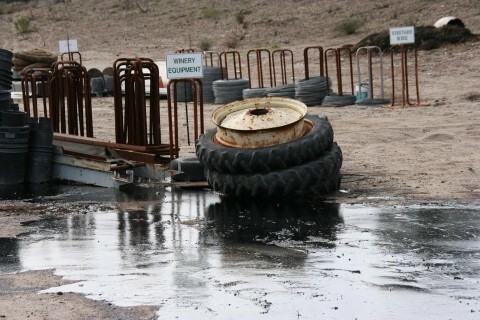 More than 84,000 gallons of oil and processed water spilled on Jan. 4. # This time, the spill happened Jan. 4 at the Davis Tank Battery facility at 5017 Zaca Station Road near Los Olivos in Santa Barbara County. The Santa Barbara County Hazardous Materials Unit estimated the amount of oil spilled at approximately 84,000 gallons, a total expected to increase as more spilled oil is recovered. This spill is similar to a large one that occurred in December at a Greka facility near Palmer Road south of Santa Maria. This time, as last time, an injection pump and alarm system failed, according to both Greka and Santa Barbara County Fire Department officials. The Dec. 7 spill released at least 58,674 gallons of oil and processed water into a creek. Greka spokesman Mike Stoker said that he believes the Jan. 4 spill might have been the result of tampering from someone outside the company. "Either there is a ghost out there, or someone is intentionally doing things to the equipment," he said. He said that Greka has hired an outside investigator to look into the circumstances of this latest spill. The investigator will present findings to the Santa Barbara County Board of Supervisors at its Jan. 15 hearing, which already had been scheduled to address the Greka spills. The latest spill began at about 6:40 p.m. on Jan 4, according to the county's fire department. Water from recent rains mixed with crude oil and processed water from the oil facility and flowed onto the property and into the adjacent creek for the next 12 hours. A passer-by reported the spill at around 7:30 a.m. on Jan. 5. The mixture of oil and water flowed about one mile downstream and crossed onto the property of Firestone Vineyard. Stoker said that HSM Electronic Protection Services, which is contracted to notify Greka of spills, failed to report the incident. "We respect the confidentiality of our client Greka," HSM President Brett Bontrager said in an interview. "We will continue, as we have been over the weekend, to look into the incident that took place." Equipment failures aside, County Fire Department Capt. Eli Iskow said that regulations require that there be containment ponds or tanks in place to capture any spills. In this case, Stoker said, the pond put in place to capture a potential spill was full of rainwater. The EPA, which has been at the site of the spill since Jan. 4, issued a statement on Jan. 9 stating that a federal investigation also is under way. "We have significant concerns whenever a company has repeated releases of oil to the environment," Daniel Meer, chief of the regional response, planning, and assessment branch of the EPA Superfund Division, said in a statement. "We will use all available tools under the Clean Water Act to ensure that this company is brought into compliance with all applicable laws and regulations," Meer said. Assemblyman Pedro Nava, whose 35th District includes Southern Santa Barbara County, has openly spoken out against the company since visiting the site of the December spill. "There are very few areas left where Greka can fail in their operations," Nava said in an interview. He noted that there are 20 other oil facility operators in Santa Barbara County, but Greka has the most violations. Stoker, the Greka spokesman, said Greka is no better or worse than other oil companies in the state when it comes to accidents. "Common sense dictates that there are always two sides to a story," Stoker said. "Starting next Tuesday, the facts are going to start coming out."